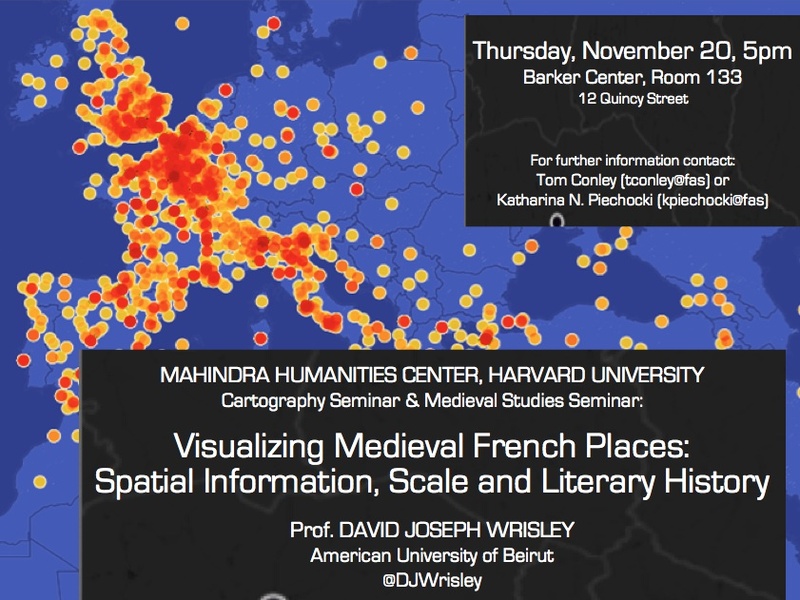 “Toponymic Strata in a Large Corpus of Medieval French” to be presented at the Digital Humanities Panel “Place in Corpora” at the Medieval Academy of America 2016 conference, Boston, Massachusetts, February 2016. “Visualizing Romance Epic Space-Time,” to be presented at Société Rencesvals American-Canadian Branch Division panel “Digital Humanities and Romance Epic: A New Approach,” Modern Language Association meeting, Austin, Texas, January 2016. “Exploring Medieval and Modern Spatial Practices in Digital Environments,” to be presented at Comparative Medieval Studies Division panel “The Spatial Turn,” Modern Language Association meeting, Austin, Texas, January 2016. “Modeling Literary Geographies: A Medium‐Data Approach to Medieval French Literary History” presented at the Medieval Francophone Literary Culture Outside of France conference, King’s College, Cambridge, 10-12 April 2014.